BLACK DIAMOND arriving in Postojna – 11 April 2015 we will play at the Club Jazzy !!! If you are afraid of loud, energetic heavy metal, such as this should be – full of toxic riffs, heavy drums, thundering bass and killer vocals, then one day prefer to stay at home and watch TV Golico … If you’re not afraid then invite your friends to presentation of our songs from debut album Last Man Standing and single Endless Road. We will have party late into the night! Time is for Black Diamond to play at the Primorska region – 22.nov 2015 are coming in Figa Rock Bar in Koper. Black Diamond for the first time are coming to Maribor concert stages, specifically in the MC Pekarna. Maribor is in some way our home ground, the band in fact have two members from Maribor – Primoz Pavlin and Marko Soršak – Soki. Baptism of the concert with the Black Diamond they experienced in July at the festival MetalDays, now it’s the time and honor for both of them to play on their home ground the first full length concert! What can you expect from the concert ?! Energetically played songs from our debut album Last Man Standing + premiere live performance single Endless Road! In short, almost two hours sharp, heavy metal! Does not to miss it! 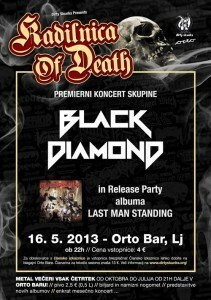 Black Diamond Concert at Lokal Patriot Novo mesto. 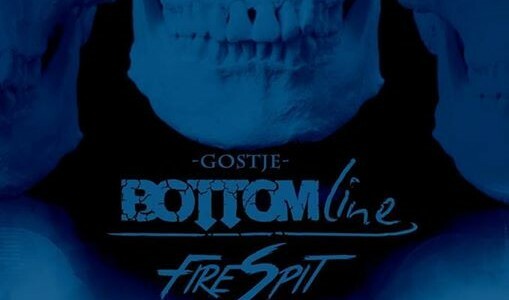 Summer is coming and with it the biggest festival in the Slovenian territory, Metaldays 2013. 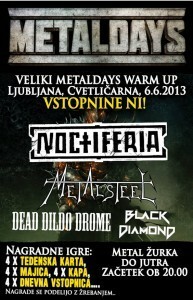 In Cvetličarna have prepared a lot of heat for said metal party of the year. Admission is free, starting at 20 pm, join them!